The annual North Coast Music Festival returns for its ninth year to Chicago’s Union Park on August 31-September 2. 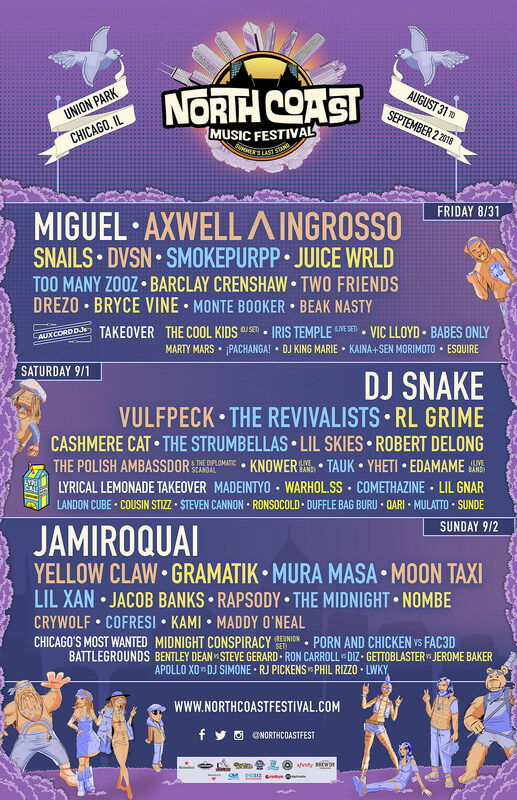 Miguel, DJ Snake, and Jamiroquai headline the festival’s 2018 edition, which also features sets from Rapsody, Smokepurpp, Axwell ^ Ingrosso, Snails, dvsn, Cashmere Cat, RL Grime, Robert DeLong, Mura Masa, Moon Taxi and more. This year also features new daily showcases curated by industry collectives. See the lineup in full below. Tickets to North Coast are on sale now, and include 3 day GA, single day GA, and VIP options.